Cresswind Charlotte is a beautiful 55+ community in Central North Carolina. Prospective homeowners will have nine different floor plans to choose from and each are highly customizable. The homes range in size from 1,448 to 2,547 square feet of living space. They include two or three bedrooms, two or two-and-a-half bathrooms, and two-car garages. Prices vary between the mid $200s and high $300s, making it attractive to active adults looking for a second home or a full-time retirement location. All homes feature modern trends like open plans, gourmet kitchens, walk-in closets, and first-floor master suites. Each home includes many customizable options for homeowners. Cresswind Charlotte will boast highly sought-after, resort-style amenities. The main attraction is the 18,000 square-foot clubhouse. It will include a state-of-the-art fitness center, yoga studio, and indoor pool for residents to stay active. The clubhouse will also feature an arts and crafts studio, lounge, game room, multi-purpose room, and demonstration kitchen. The community will take full advantage of its picturesque outdoor setting with several amenities, allowing residents to stay active while enjoying the community’s beautiful setting. These includes two bocce ball courts, two tennis courts, and four pickleball courts. Steps from the clubhouse will be a resort-style pool surrounded by a large patio with shaded areas. Another prime outdoor amenity will be the miles of walking trails that wind throughout the community’s wooded environs, making it perfect for a relaxing walk in nature. As with many other Cresswind communities, there is sure to be an active social life. Homeowners will be able to participate in fitness classes like yoga. There will also be groups for arts and crafts, board and card games, and cooking classes. That’s just a small selection of lifestyle options, as the community will also feature several groups, classes, and clubs. Cresswind Charlotte will be a community that promotes a healthy and active lifestyle through its various amenities and lifestyle options. Being able to join various sports leagues and clubs like bocce, tennis, pickleball, and swimming will allow retirees to stay active and enjoy a healthy retirement. Besides incredible homes, amenities, and lifestyle options, Cresswind Charlotte is located in one of the most popular areas in the country. 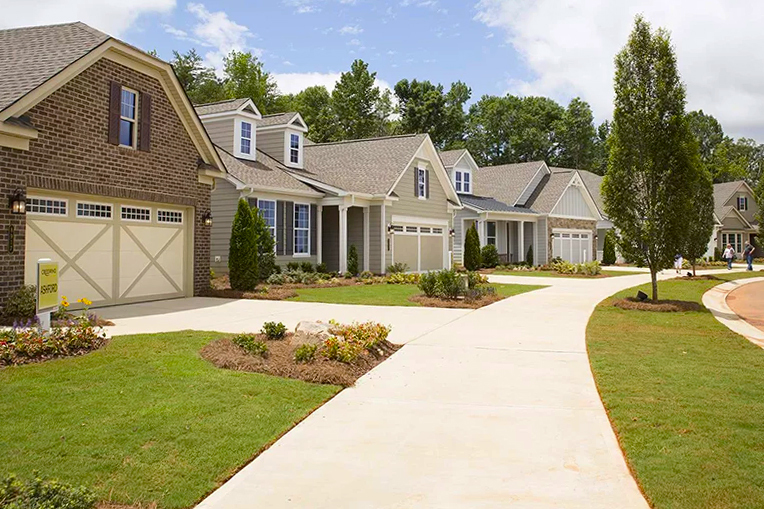 Ideally situated right off Interstate 486 just east of Charlotte, residents will have easy access to downtown Charlotte and the city’s many beautiful suburbs. The Larkhaven Golf Club is a short walk from the community and several other highly rated golf courses and country clubs. Residents are never far from shopping centers, restaurants, and entertainment venues either. Sports fans will also love being able to catch various professional sports, like the Carolina Panthers and Charlotte Hornets. A vacation is never out of the question either, as Charlotte Douglas International Airport is only a few miles away. If you’re an active adult looking for a community in North Carolina, it will be hard to pass up what Cresswind Charlotte has to offer.